Angels trade Alberto Callaspo to the A’s for Grant Green. The Angels have traded infielder Alberto Callaspo to the A’s for minor-league infielder Grant Green. Green is playing for Triple-A Sacramento, where he is batting .325/.379/.500 with 11 home runs and 50 RBIs in 87 games. He was hitless in his only 15 at-bats for the A’s this season. Callaspo was hitting .253 with five home runs and 36 RBIs as the Angels’ everyday third baseman. Last year he batted .252, the lowest batting average he’s had in a full season in his career. He is under contract through 2014 and the Angels could use the money saved to make multiple deals before tomorrow’s 1 p.m. non-waiver trade deadline. Callaspo originally came to the Angels in a July 2010 trade with the Kansas City Royals for Will Smith and Sean O’Sullivan. Green attended Cal State Fullerton and Canyon High School in Anaheim. He was ranked as Baseball America’s 63rd-best prospect prior to the 2011 season. Chris Nelson was pulled from the Triple-A Salt Lake Bees’ game against the Iowa Cubs, a strong indication that he will be recalled to take Callaspo’s spot on the 25-man roster. Angels designate Brad Hawpe for assignment. The Angels have designated first baseman/outfielder Brad Hawpe for assignment and added Triple-A pitcher Daniel Stange to their 40-man roster. Hawpe was an All-Star with the Colorado Rockies five years ago, and one of several veteran reclamation projects the Angels used to fill out the bottom of their 40-man roster. After a good showing at Triple-A, he never got hot in the majors, batting .185 (5 for 27) in 17 games with the Angels. Stange, a 27-year-old right-hander, was 3-0 with a 3.60 earned-run average in 15 games, all in relief, for Salt Lake. He was released by the San Diego Padres on June 16 and signed a minor-league contract with the Angels five days later. He was drafted by the Arizona Diamondbacks out of UC Riverside in 2006, when current Angels general manager Jerry Dipoto was the D-Backs’ director of scouting and player personnel. 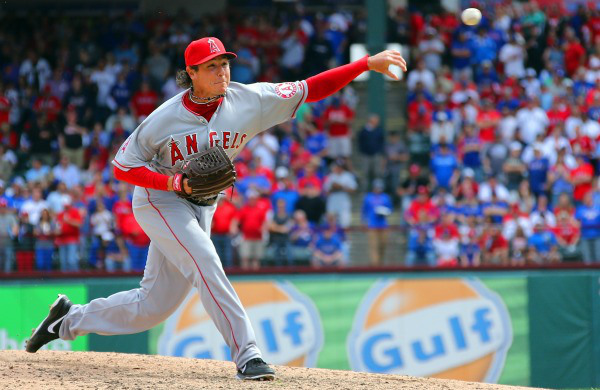 Angels trade Scott Downs to Atlanta for Cory Rasmus. The Angels traded Scott Downs to the Atlanta Braves for Triple-A pitcher Cory Rasmus on Monday, two days before baseball’s non-waiver trade deadline. Rasmus, who made his major-league debut in May, is the brother of Toronto Blue Jays outfielder Colby Rasmus. He’ll go straight to Triple-A Salt Lake. The Angels recalled left-handed reliever Nick Maronde from Double-A Arkansas and activated him for tonight’s game in Texas (4 p.m. PST, ESPN).